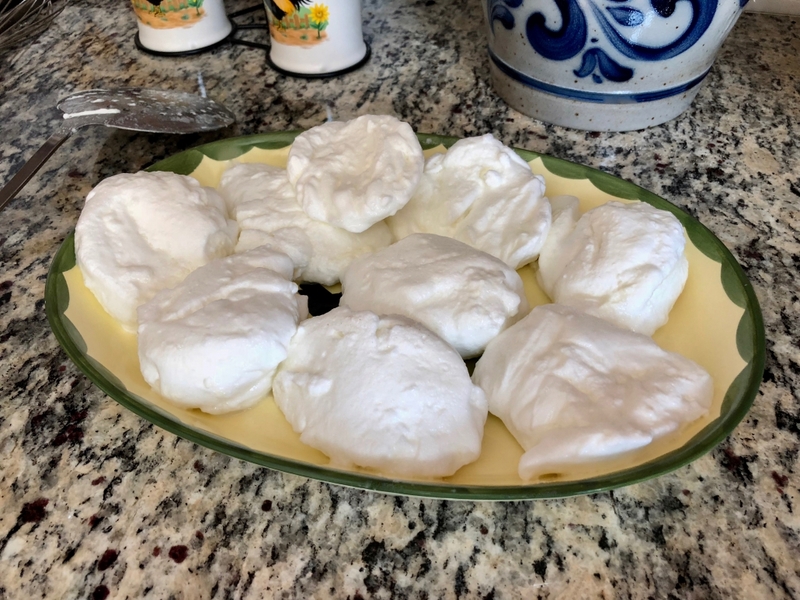 The Original German Schneenockerl Snowballs recipe is easy to prepare. Egg whites, powdered sugar, and lemon juice make the snowballs. Served with warm homemade vanilla sauce, delicious. Separate the eggs using an egg divider. 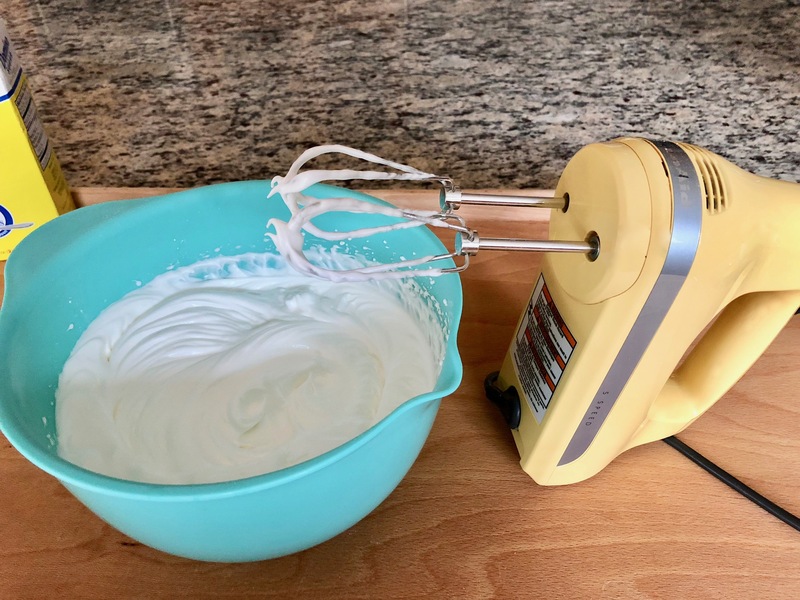 Beat the egg whites with an electric handheld mixer and add the powdered sugar and lemon juice slowly. Continue beating until the egg whites are stiff. Place aside. Pour the milk into a saucepan and add the sugar and salt. Heat up the milk until it boils. Turn the heat back. 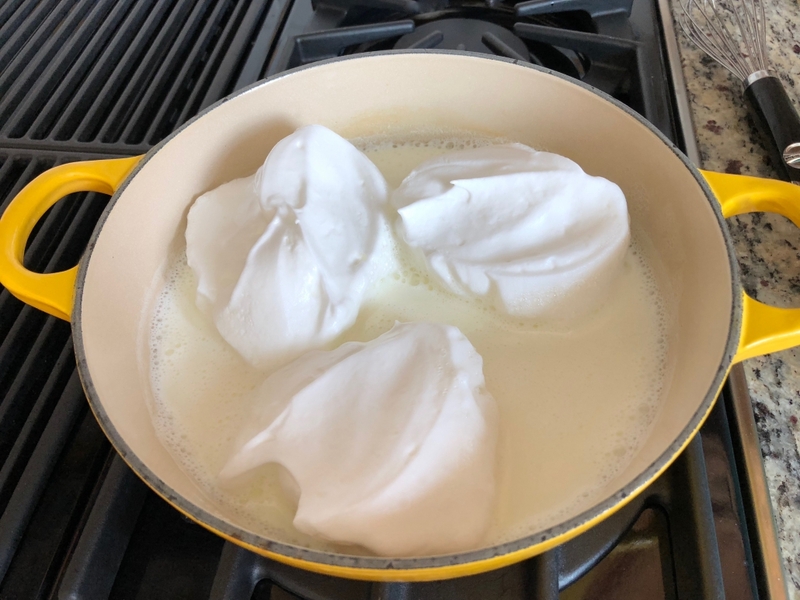 Shape the snowballs with a tablespoon and add them to the simmering milk. Poach the Nockerl on each side for about 2 minutes. Turn the Nockerln from the outside to the center of the saucepan, otherwise they will stick to the pot. Take the Nockerln out with a slotted spoon and place them on a plate. Stir the vanilla pudding powder into a half cup of milk and stir with a fork until dissolved. Place aside. Pass the milk through a sieve into another saucepan. Fill it up to 700 ml (1.47 pt) if necessary. Cut the vanilla bean lengthwise in half and scratch the seeds out. Add the seeds and the bean to the milk and bring it to a boil. Remove the vanilla bean and add the dissolved pudding powder while continually stirring until the vanilla sauce thickens. Turn the heat off. You also could use the egg yolks to thicken the vanilla sauce. Beat the egg yolks with a fork, pull the milk off the stove, while continually stirring mix the egg yolks into the milk. Bring back to a boil again until the sauce thickens and turn the heat off. Serve the Schneenockerln on a plate on top of the warm vanilla sauce. To refine the snowballs, top them with chocolate sprinkles. To try the German Schokokuss Sweets click here, 5 Delicious Pudding Recipes click here, and the Vanilla Cheese Pudding Recipe click here.